Offering you a complete choice of products which include kids rompers, new born body suit, new born rompers, baby body suits, baby rompers and baby romper. Providing you the best range of kids rompers, infant rompers, new born rompers, baby rompers, kids gift sets and baby caps with effective & timely delivery. 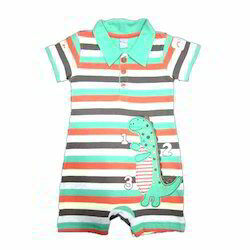 Introduced in the global market, we have emerged in the industry as a manufacturer, supplier and exporter Kids Rompers. To fulfill the demands of customers, we offer these rompers in different sizes and designs as per the demands of customers. 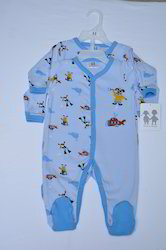 Moreover, our clients can purchase these rompers at industry leading prices. Creating new benchmarks in the industry as a manufacturer, supplier and exporter, we are engrossed in providing Kids Rombers To match up with the demands of customers, we offer these sets in different colors, sizes and designs. Assured to provide timely delivery of the consignment, we have mustered huge client-base. Being one of the leading manufacturers, suppliers and exporters, we are engaged in offering Baby body suite. By making use of lycra and viscose that are obtained from the accredited vendors of the industry, these sets are manufactured with utmost perfection in compliance with the prevailing trends of the market. Skin-friendly in nature, these sets are comfortable to wear. Keeping in sync with the changing market trends, we have emerged in the industry as a manufacturer, supplier and exporter of Baby Rompers. Under the guidance of experts, these rompers are superbly stitched without leaving any scope for defects. In order to eliminate flaws, these products are checked thoroughly on various parameters by our quality controllers. Enlisted among the illustrious manufacturers, suppliers and exporters, we are engaged in offering Infant Rombers. Embellished with fine embroidery work, these sets are manufactured with sophistication in tandem with the prevailing market trends. Alluring in patterns, our offered pyjama sets are offered at industry leading prices. To cater to the demands of customers, we have emerged in the industry as a manufacturer, supplier and exporter of Infant Rompers. Exclusively designed, these rompers are manufactured at our spacious infrastructure facility, which is segregated into different departments. Can be availed in different colors and patterns, these products are offered at industry leading prices. Introduced in the industry as a manufacturer, supplier and exporter, we are engaged in offering Kids Body Suits. Demanded for kids of all age group, these suits are manufactured with sophistication in adherence with the prevailing market trends. Delivering in bulk quantities, we have gained huge client-base across the globe. 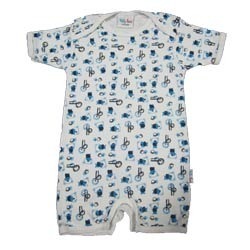 Engaged as a manufacturer, supplier and exporter, we are engaged in offering a commendable range of New Born Rompers. Trendy in looks, these products are designed and developed in compliance with the guidelines laid in the fashion industry. Additionally, we offer these rompers in different colors, designs and patterns. Available in Girls,Boys and Neutral colours. Fabric: 100% Cotton, Interlock or Rib. 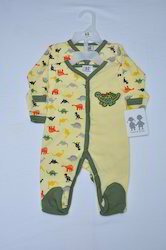 Fostered with a team of experienced professionals, we have been able to manufacture, supply and export Kids Body Suits. Our offered suits are designed with the aid of ultra-modern machinery and technology, which enables us to meet the bulk demands of customers. We offer these suits in plethora of colors, sizes and designs to suit the demands of customers. Looking for BABY ROMPERS ?